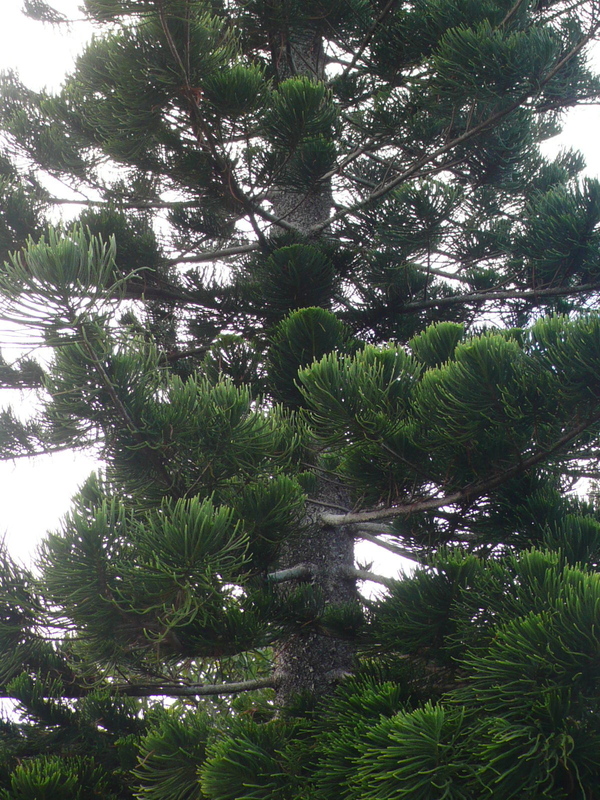 Norfolk Island Pine: Araucaria heterophylla and Cook Pine: Araucaria columnaris, are both in the Araucariaceae family. 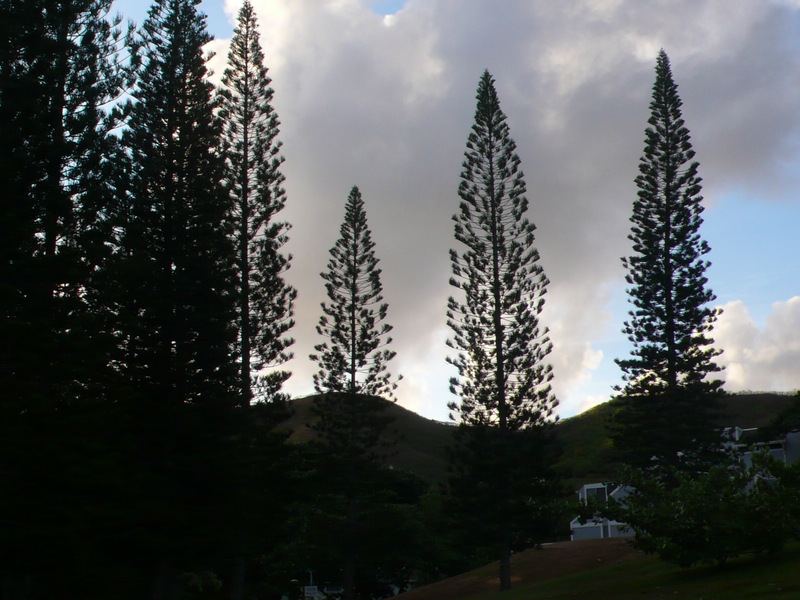 These evergreens are common throughout the Hawaiian Islands as an introduced species. 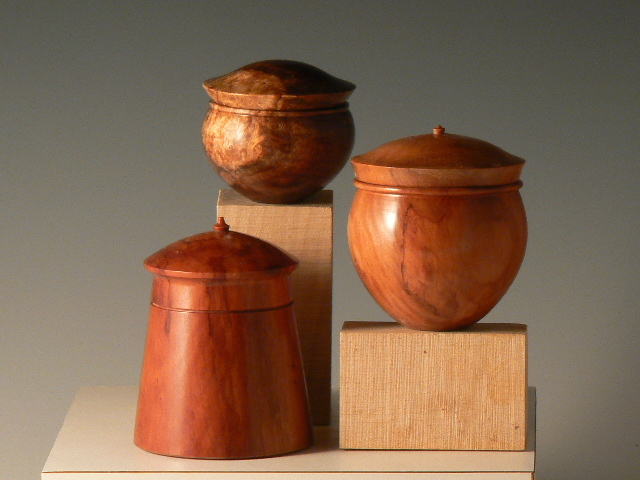 The smaller sizes are often used as Christmas trees during the holidays. 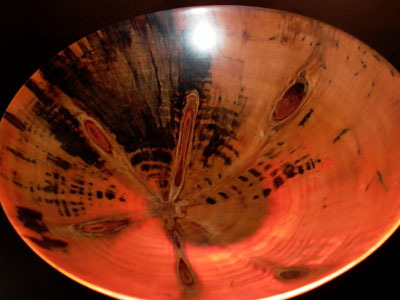 Norfolk Island Pine (NIP) is a more familiar name than Cook Pine (CP) and is often called just Norfolk Pine. 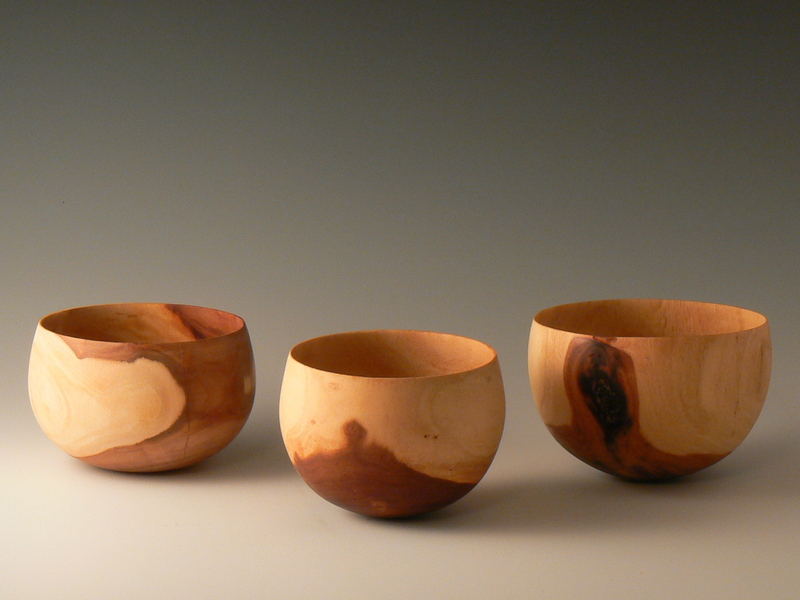 Recycling wood from these trees is a win-win situation. Something useful can be made from the wood and the tree trimmer can save on tipping fees as fees are determined by weight. Our club sends out an email “Wood Alert” whenever a tree is cut down and made available for recycling. There is an alert sent out on NIP and CP at least once a month, and sometimes more often. CP can usually be distinguished from NIP by the way the pine needle growth tends to be more towards the end of the branches. Of course, what makes these pines interesting is that the branches are around the trunk at the basically the same level on different ranks. 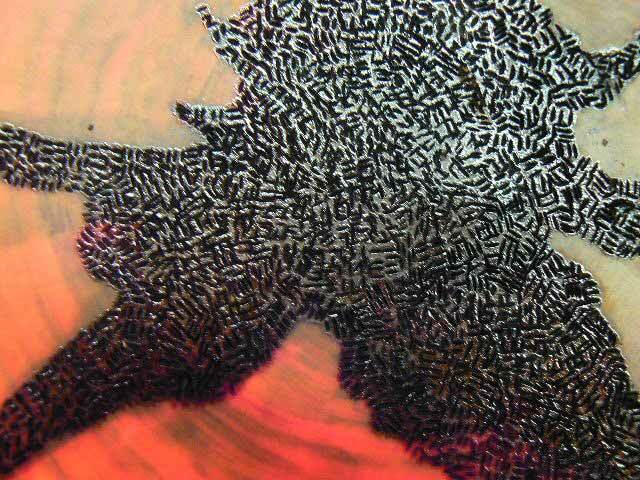 The number of branches on each rank can differ from 4 branches up to 9 branches, but towards the bottom of the trunk, there tends to be a smaller number, because the branches will crowd each other out as the tree matures. 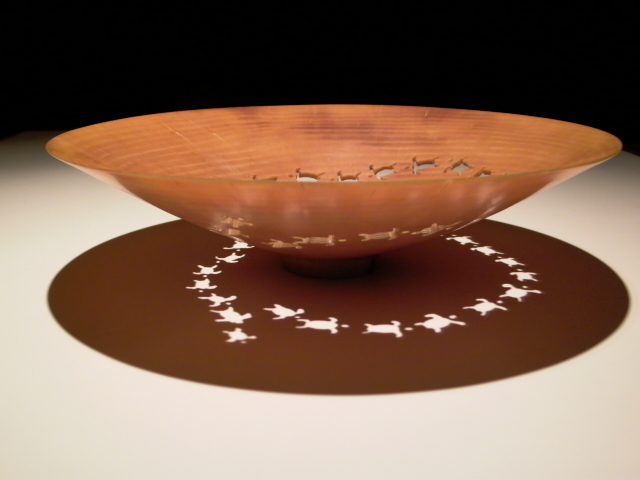 The branches will go to the center of the trunk, which will account for a star-shaped pattern if the trunk is cut just in the right place and intercepts the branches in the walls of a bowl form. 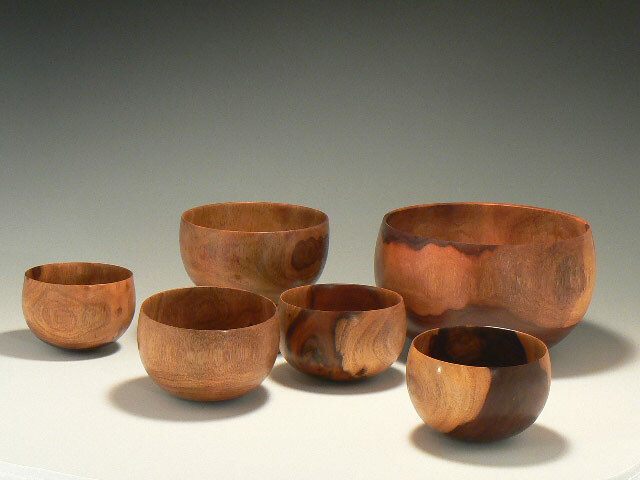 Alternately, the branches if cut high up in the form will be ovals of darker, harder wood, or knots. 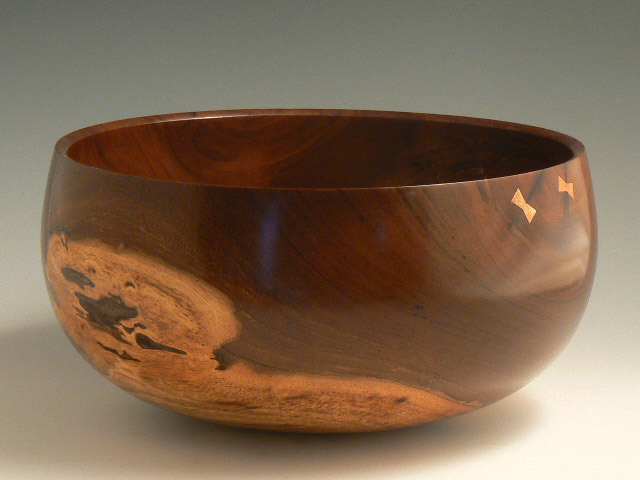 When freshly cut, the wood will exhibit a creamy, golden color, sometimes with darker specks sprinkled throughout. Left out in the weather, the wood will spalt and develop a stain in as little as a week, but often in one or two months or more. How quickly this happens is attributed to how often it rains and the stains follow the grain lines from the cut edges inward. 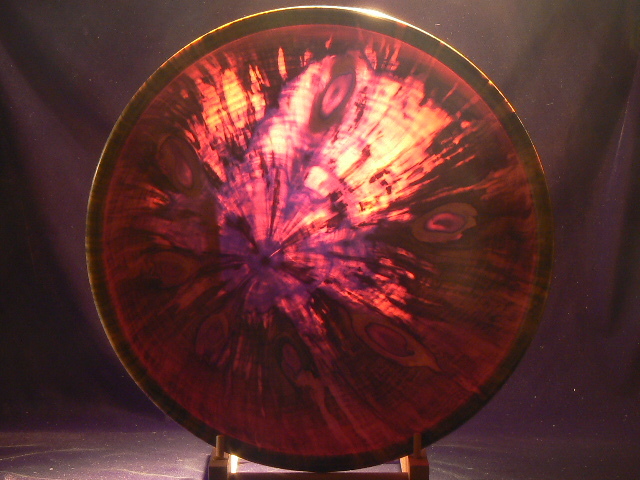 With regard to translucence, light will not transmit through the dark stain from spalting, nor through the stains that sometime occur in the center of the trunk area. 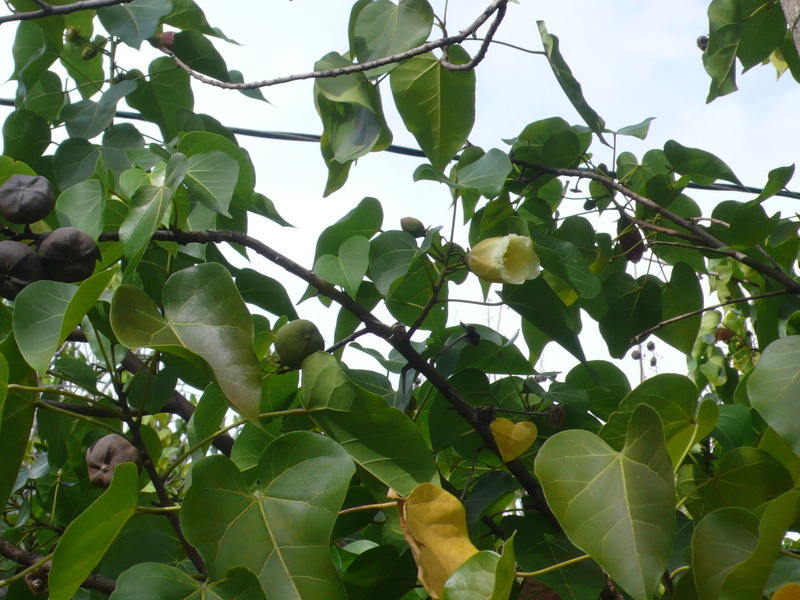 Because NIP is the more familiar name, many of the trees are identified as NIP, although in reality they are CP. In my experience, the majority of the trees in these islands are CP. Once cut and the branches are removed, however, it is almost impossible to tell the difference between the two. The bark on the CP tends to be more flaky than the NIP, but a side-by side comparison is often not reliable. 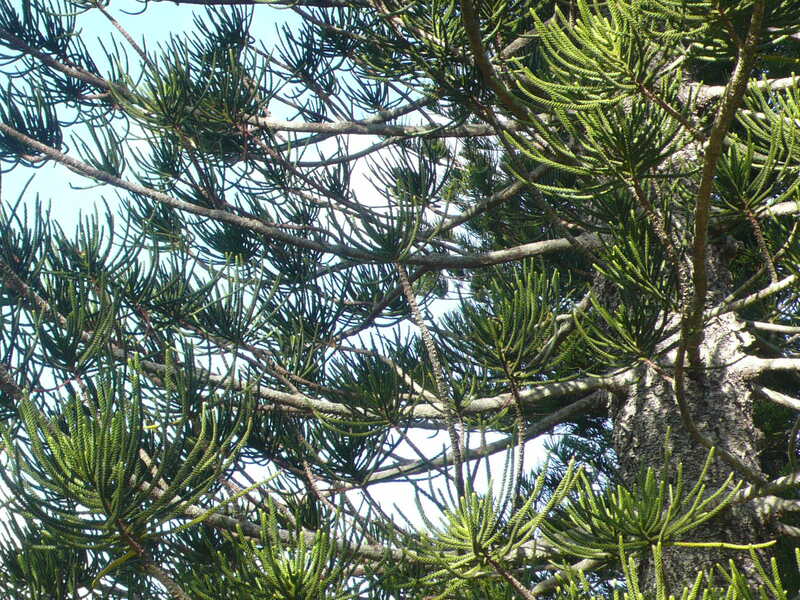 This group of trees are all Cook Pine, characterized by the needles towards the ends of the branches. This is a closer look at the trunk of a Cook Pine. Note the branches on the same level on each rank of branches. The tree on the right is obviously Cook Pine. On the left, however, it is difficult to tell. 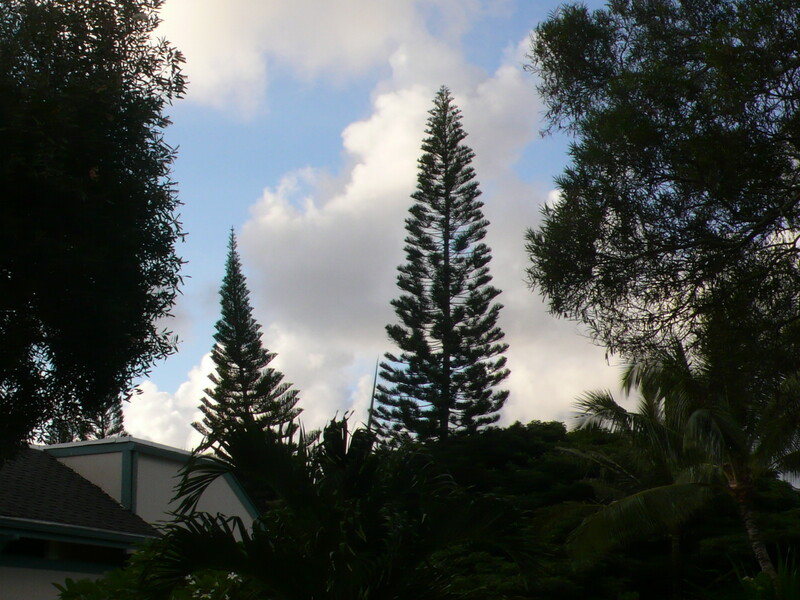 If it is Norfolk Pine, it is perhaps the only one of perhaps 25 pine trees in this condominium development that are Cook Pine. 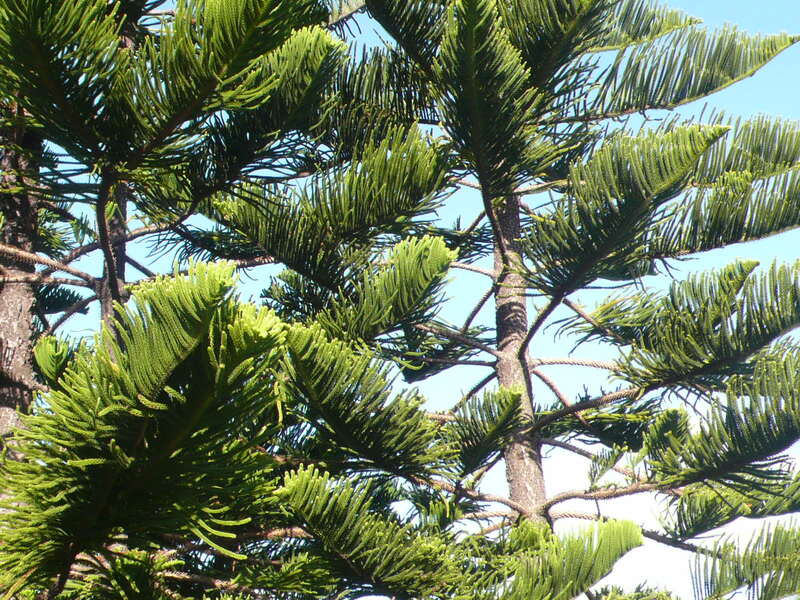 The photo above is a close-up of what appears to be Norfolk Island Pine branches. The needles on the branches tend to stick up directly from the branches and the needles tend to be more full on the branch. 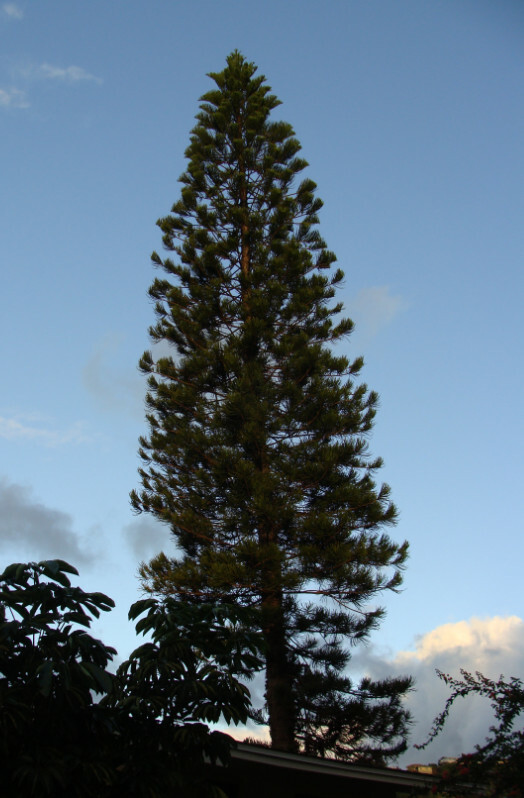 On the Cook Island Pine, the needles tend to stick up in clusters; more like a branchlet on the branches. The needles tend to be towards the end of the branch, often leaving the branch bare except for the cluster of needles at the ends of the branches. 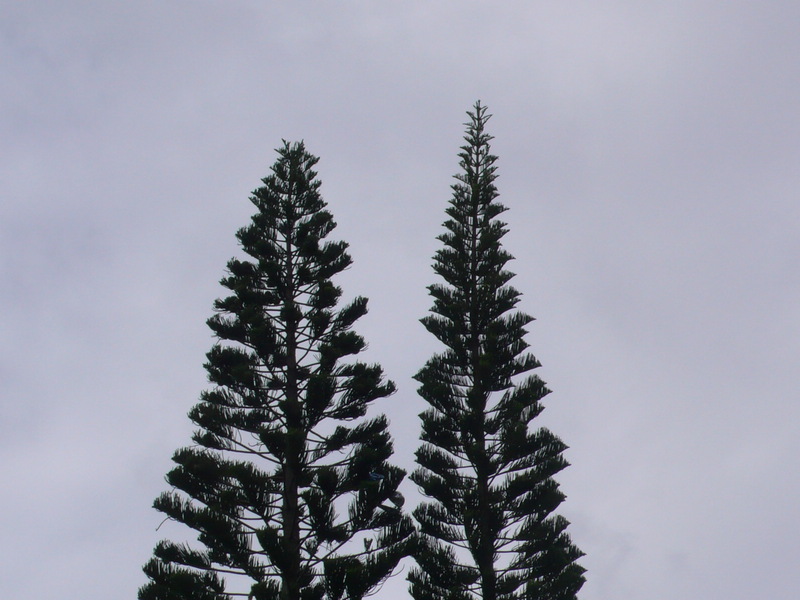 Using the identifying criteria for the tree tops, the tree on the left is a Cook Island Pine, and the tree on the right is a Norfolk Island Pine. 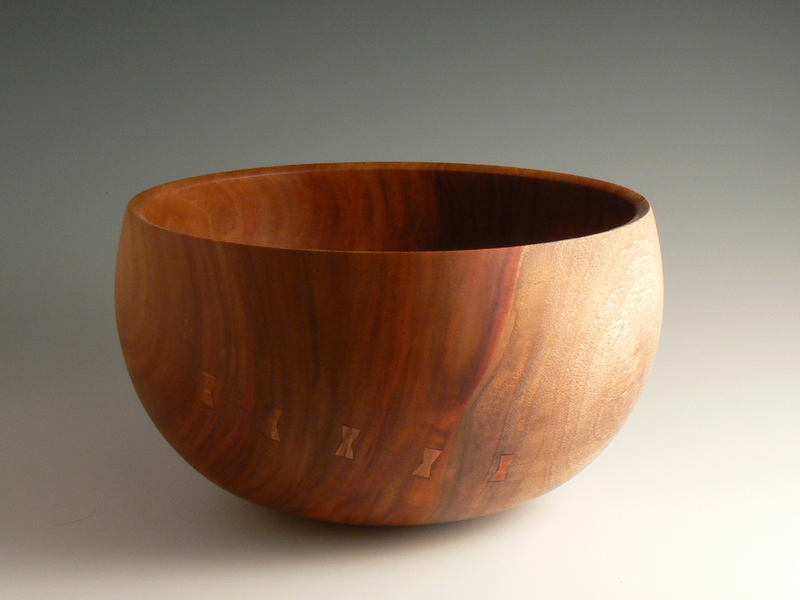 When the trees are going through seasonal growth spurts at the top of the trees, which is at the beginning months of the year in Hawaii, all trees tend to look like Norfolk until the new growth matures and develops either a bushy top or a more cruciform pattern. 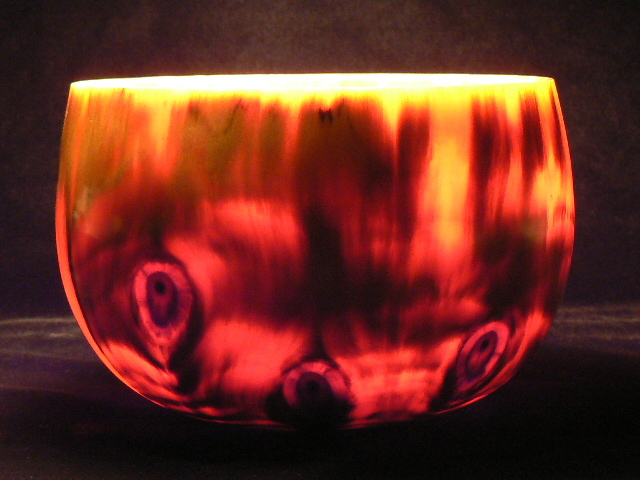 This is one of my first translucent bowls, made in 2003. The major difference between the early examples and those made now is better equipment (Nova 3000 vs. Vicmarc VL300), sharper tools, experience and time to execute. 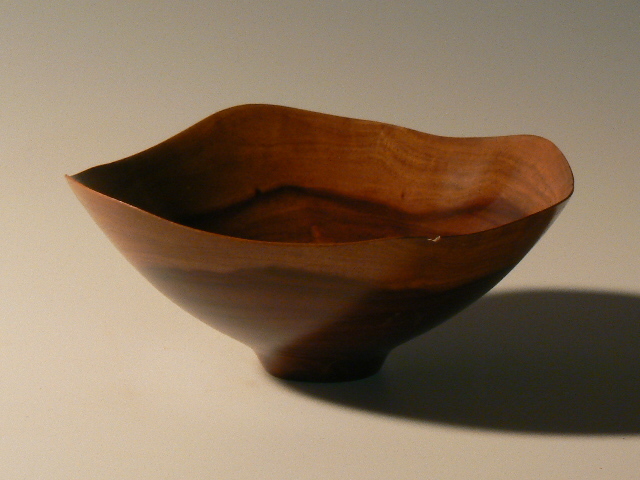 This bowl I think took the better part of two days to finish just the turning. 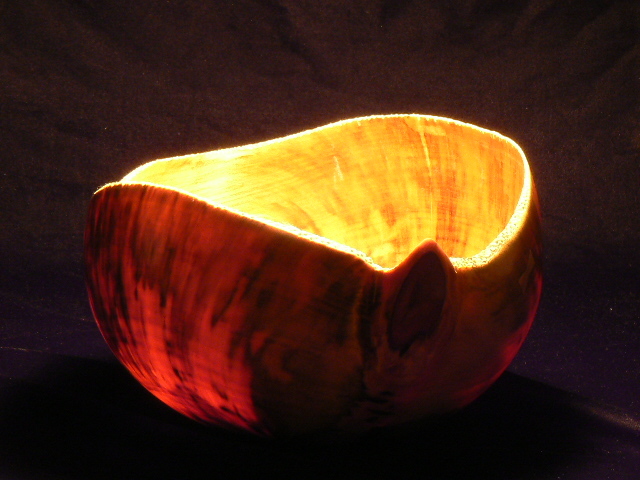 Before all I got from turning was sawdust. 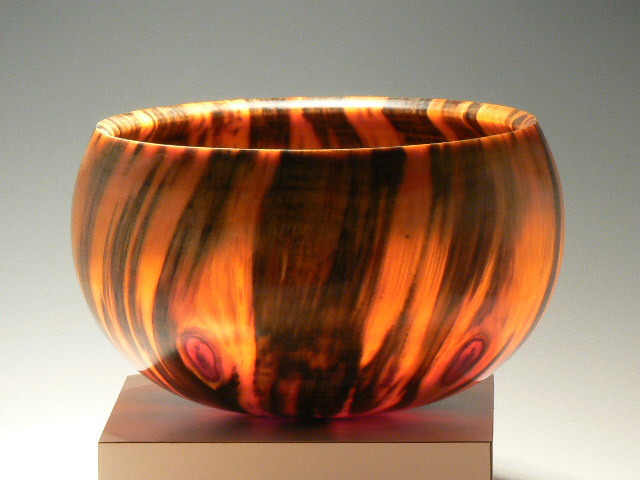 Now long streams of ribbons are possible for most of the 2-3 hours it takes to turn a piece. 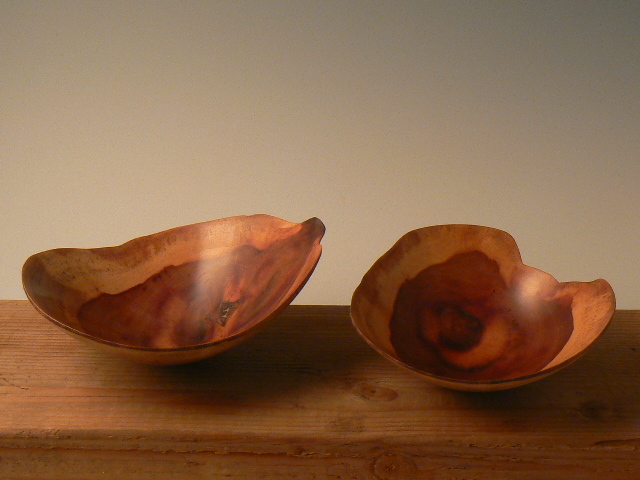 It was on my first video that Del Stubbs explained the principle of cutting with and against the grain. Translucent piece with no branches. Piercing done with a Dremel-like tool. Note on the photos: Most of these are taken in a darkened room. The camera is set on a tripod with a self-timer on auto focus and auto exposure. 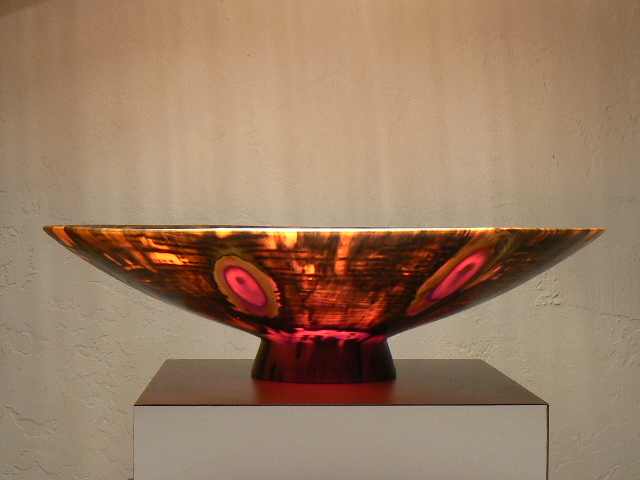 A light source is held above the piece out of the field of the photo and the self-timer is activated. Exposure can be 3 to 4 seconds. 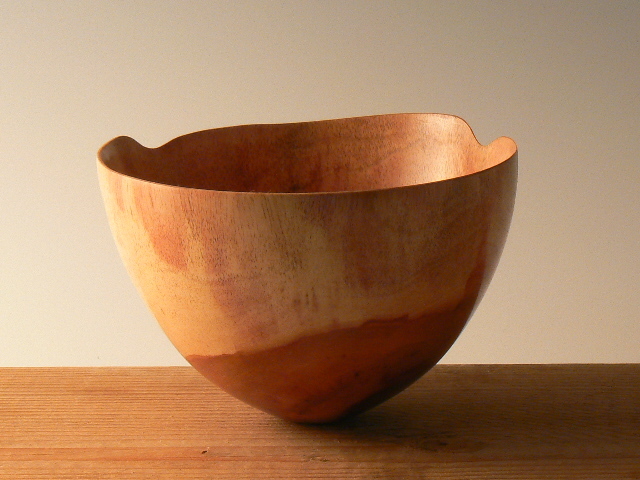 The following piece is an orientation that does not happen often for me: turning pine side grain. 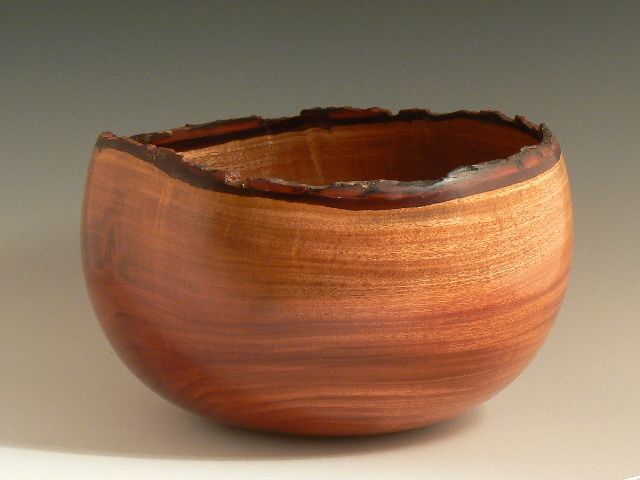 In this case, it was also natural edged with a knot featured on the rim. 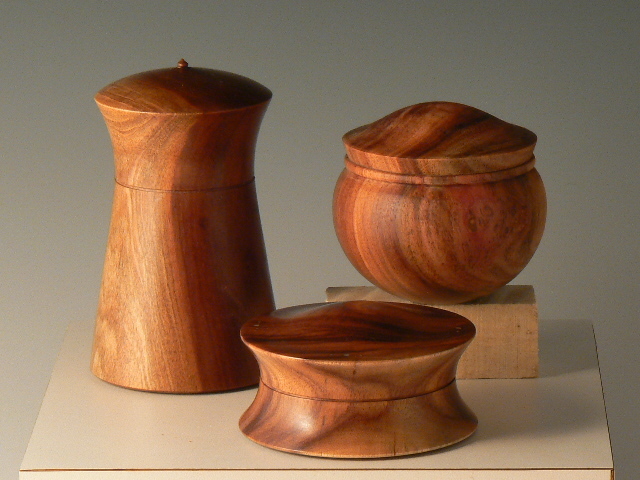 In July, we hosted Kip and Kim Christensen, and Kip demoed before our Honolulu Woodturner’s club. 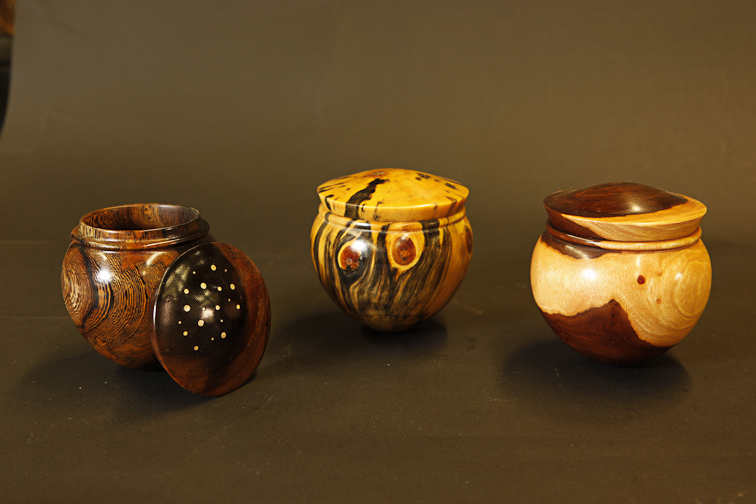 From his demo on boxes, I picked up several techniques–chatter work, inlay, reveal at the join line, and a bead at the base. He is an excellent teacher and demonstrator. I try to incorporate his methods whenever I can. 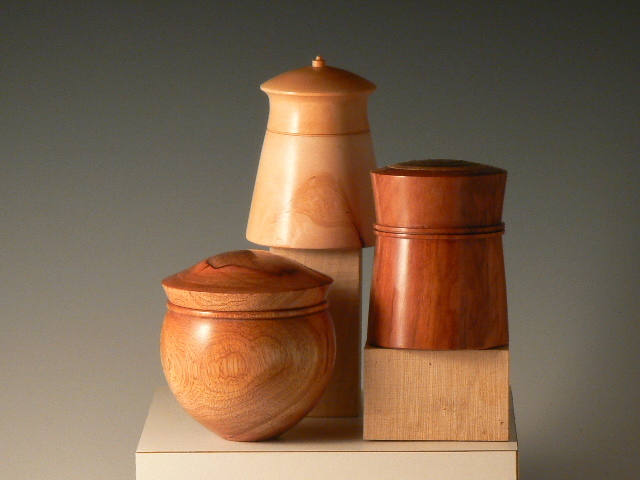 Woods: Pheasantwood (Argentium silver inlay), Norfolok/Cook Pine, Milo. 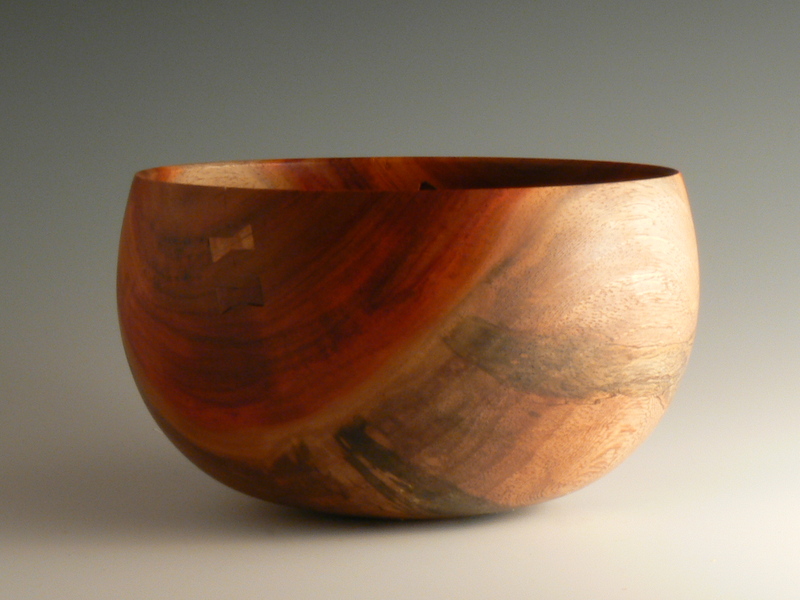 Just learned that I had two pieces accepted by this year’s juror, Allison Wong, Deputy Dir., Honolulu Academy of Arts, so I will be in this year’s exhibit, which starts on October 7th and runs to Nov. 2 at the Linekona Art Center, near the Academy of Arts but on Victoria Street, east of Thomas Square. 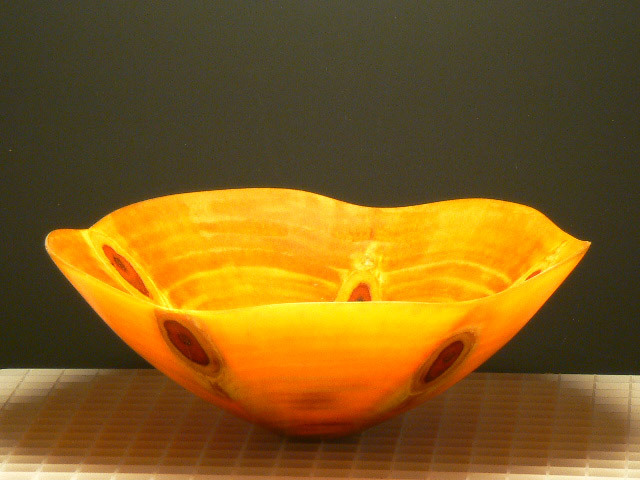 The photo is one of the pieces, a Cook Pine shallow bowl, 18″ dia. by 5″ tall. 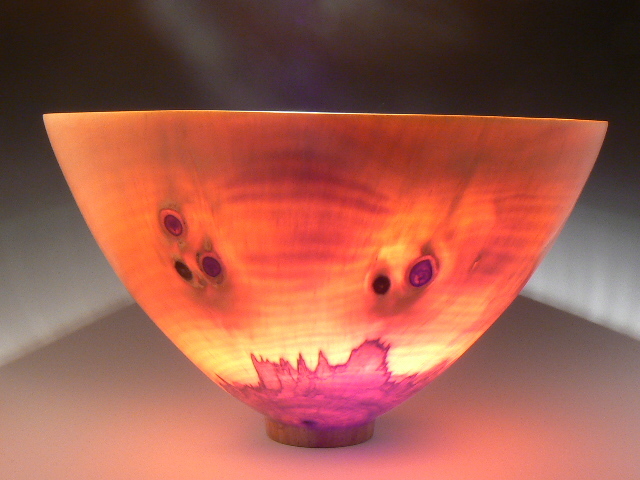 The wall thickness is 3/16″ to 1/4″ and the stain was burned with a Priddle-style “wood vaporizer”. Other photo is of tree one week before it was cut down. 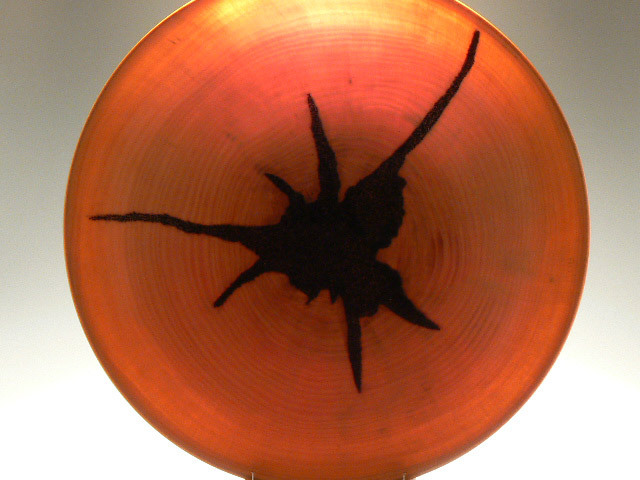 Close-up of the burn pattern in the area of the stain. 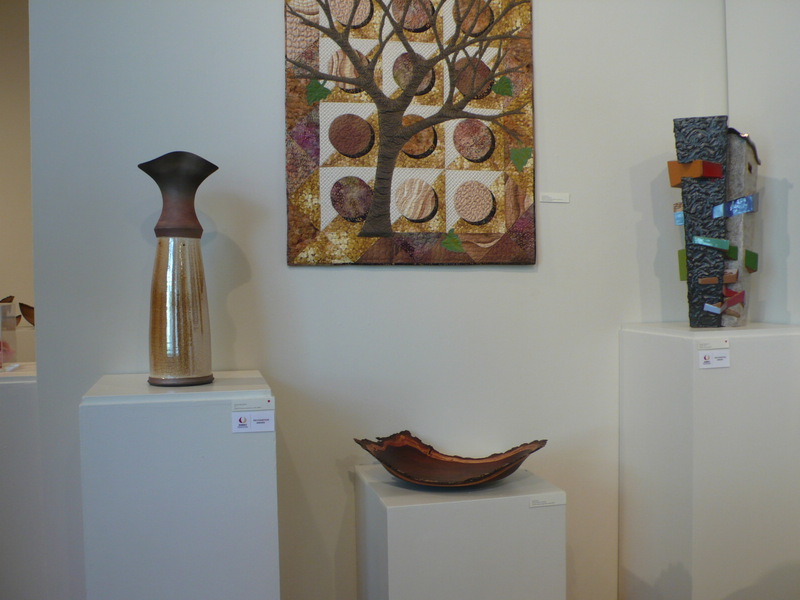 The show has less than a week to run, and I was able to take some photos of the exhibit. 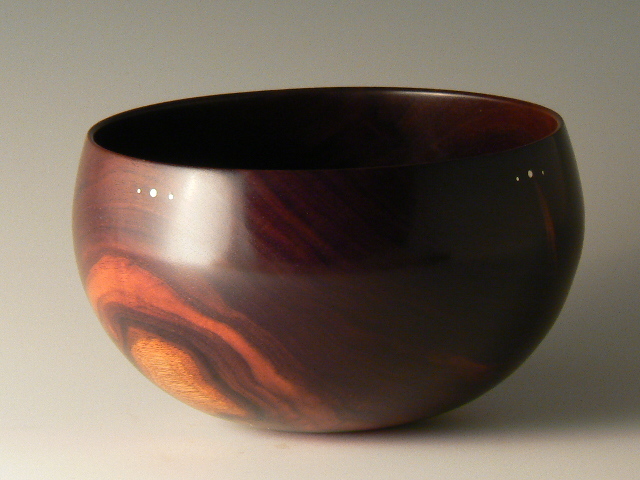 There are over 130 pieces in this multi-media display, and unfortunately, I am only concentrating on the wood pieces, and, with the exception of my two favorite pieces at the end, of fellow Honolulu Woodturners club members. 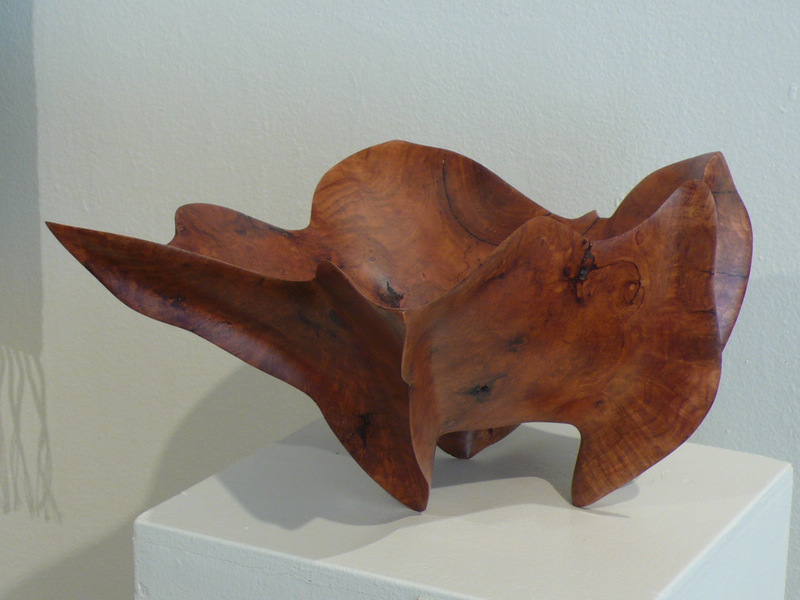 Francisco Clemente was an invited artist in wood and had a featured placement at the entrance of the exhibit. Not sure of the black piece, but I believe all 5 pieces are Francisco’s. 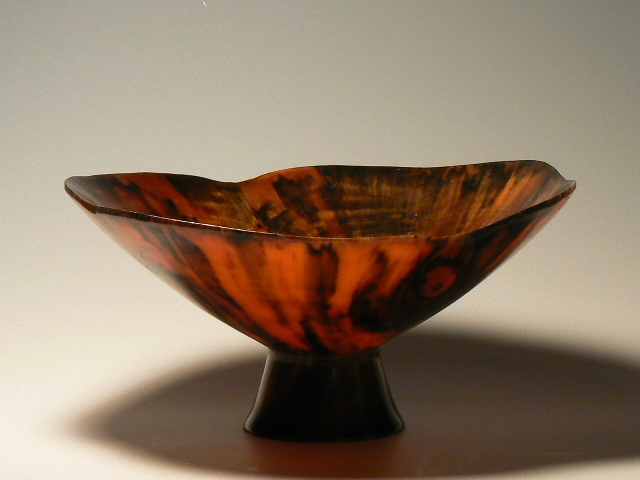 His graceful, soft carved forms and signature leg points are all a pleasure to look at. 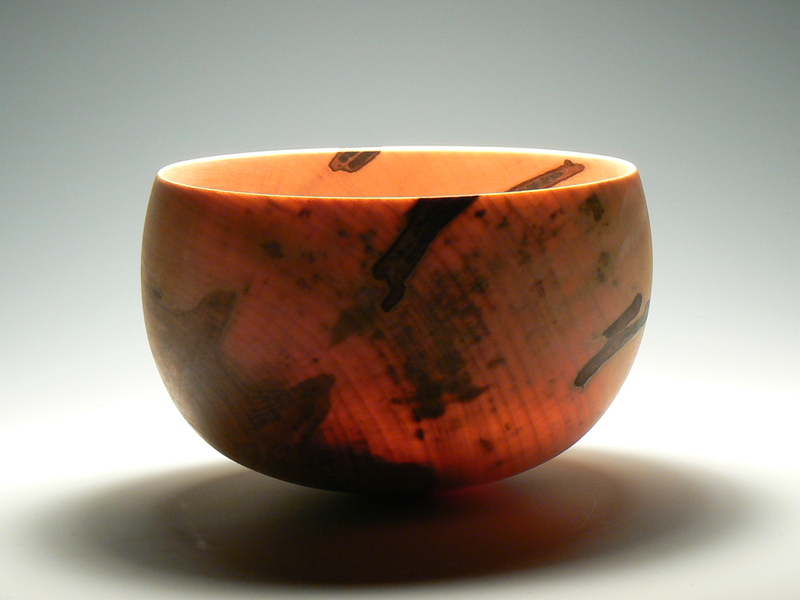 This is the Cook Pine piece that I talked about earlier. 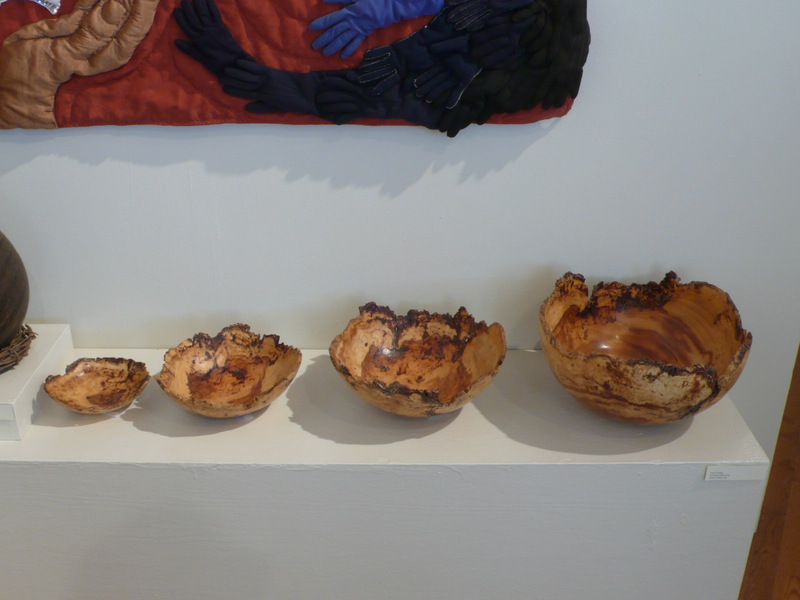 One of Sharon Doughtie’s signature burned pine knotwork pieces is to the right. 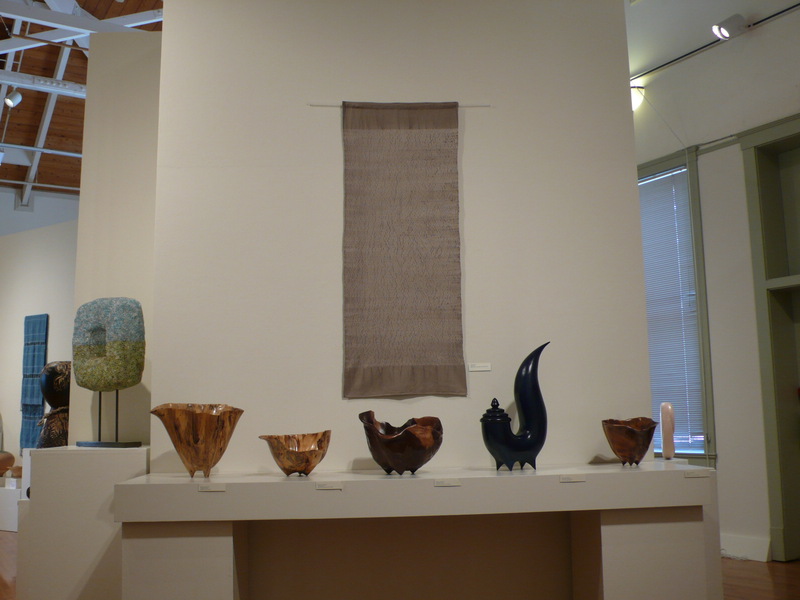 To the right of the fiber wall hanging is a pair of gourds that have been covered with intricate line work. 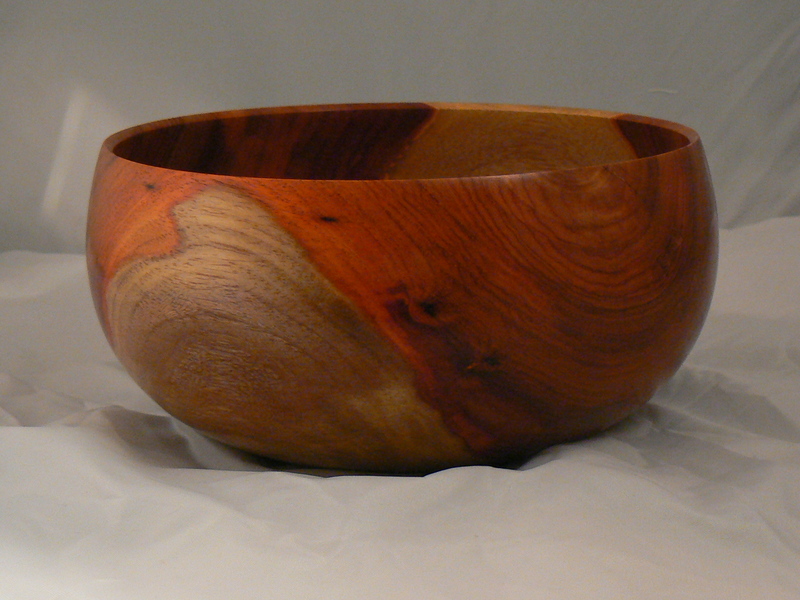 To the far left is about 40% of the profile of a huge pine piece titled Big Kahuna, and it is. This is my natural edge nested set, cored with the Oneway center saver. 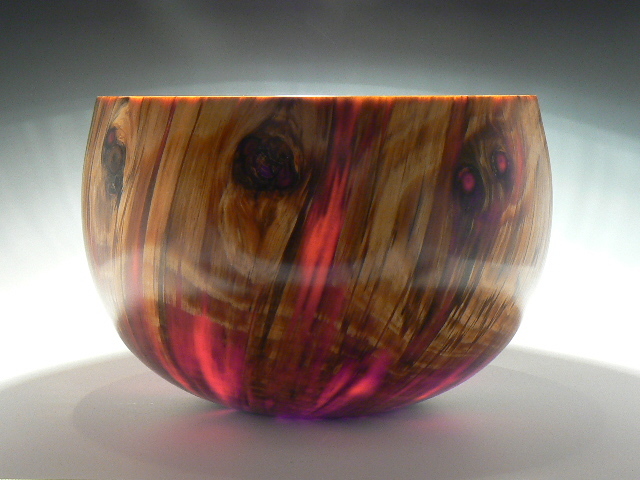 Not sure of the wood, but I am calling it Siris burl. Thanks to fellow clubmember Fred Humphrey who provided the wood. 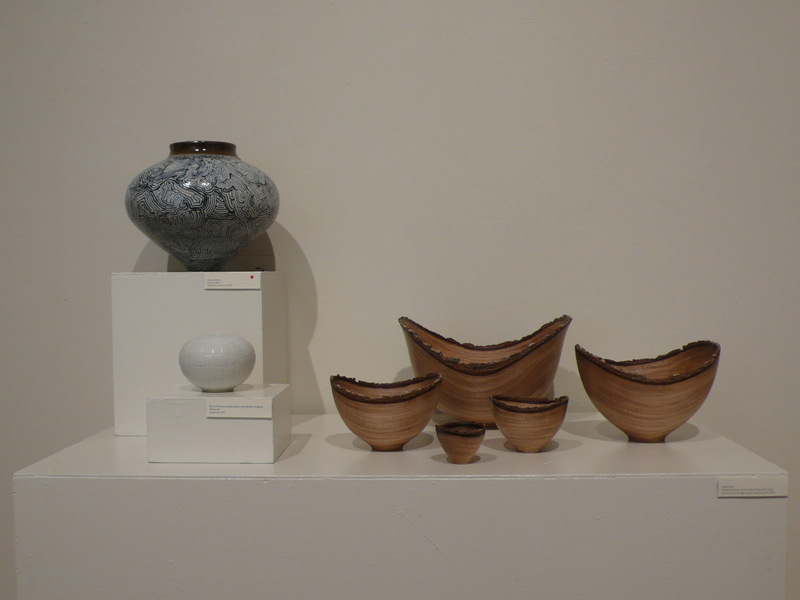 Andy Cole’s nested set from China Doll wood. Andy Cole’s large natural edge Milo platter. 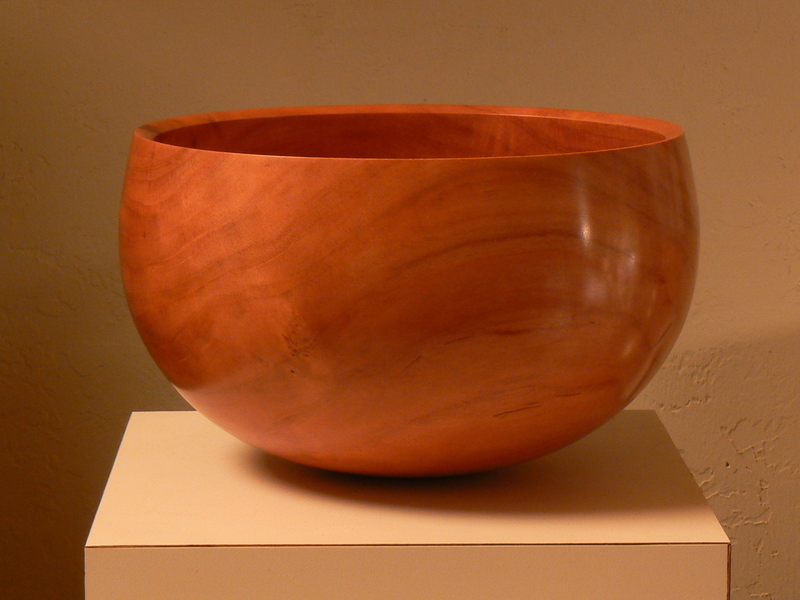 Eric LeBuse’s winged bowl and Milo umeke form. 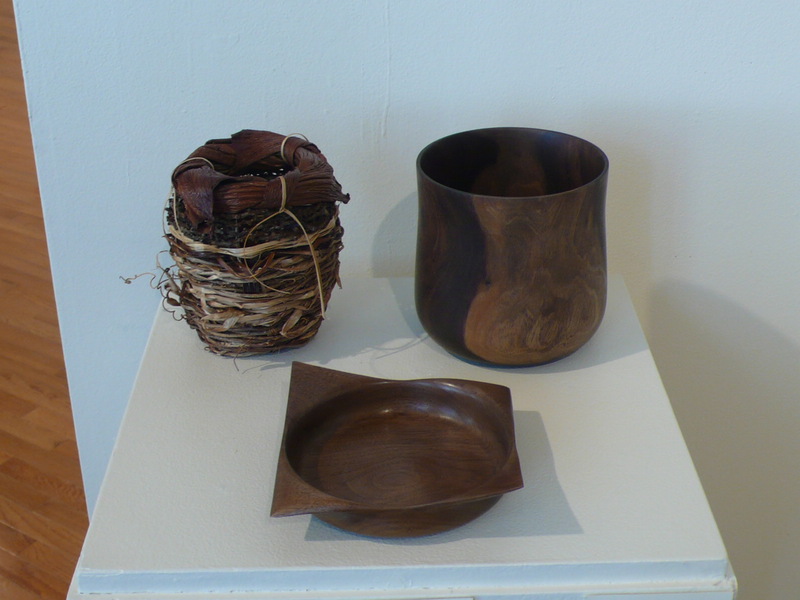 Foreground: Gordon Tang’s two carved Koa pieces. 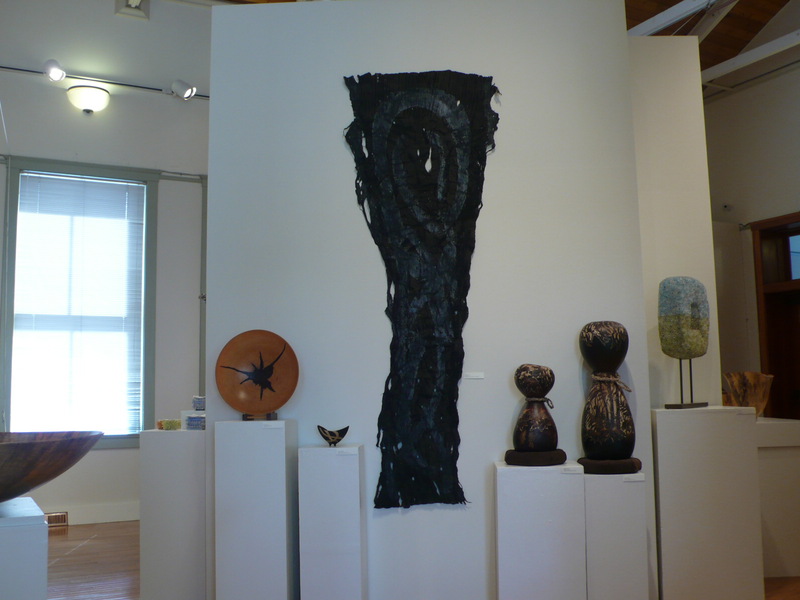 John Mydock of the Big Island received an Award of Excellence for this piece titled “Spiral Galaxy”. The detail on the burning is incredible! 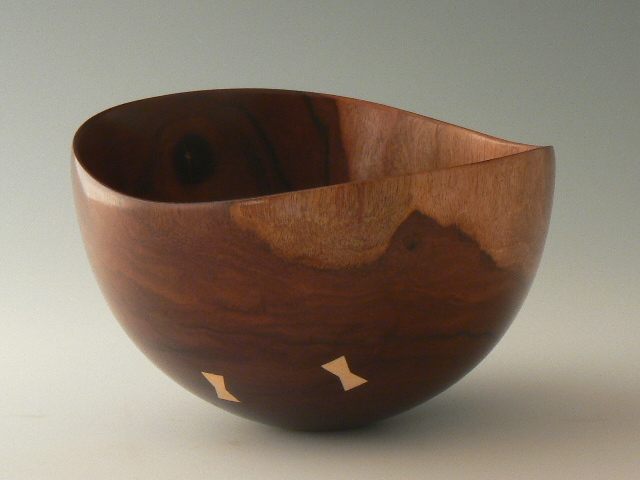 John is relatively new to turning, but as you can see, he is an accomplished artist. 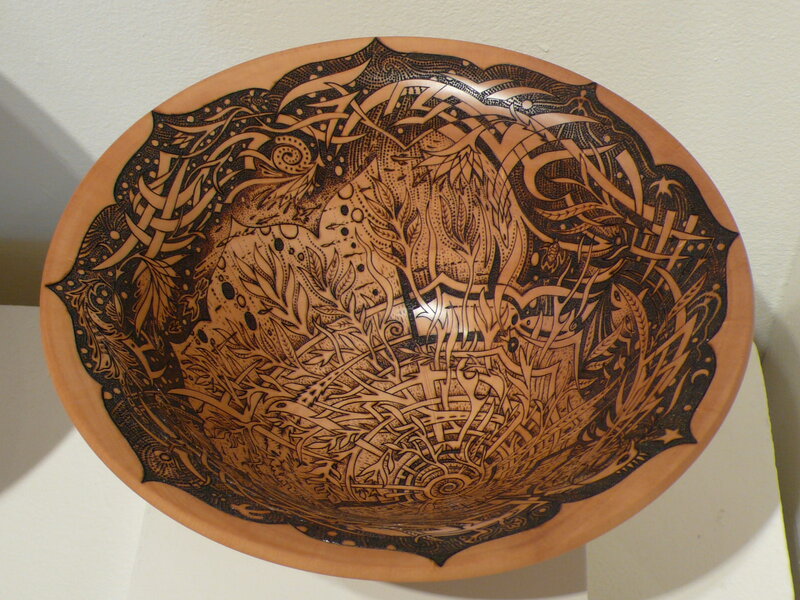 A year ago, when Jimmy Clewes participated in the 2nd Honolulu Symposium, he saw another piece that John had made, and Jimmy said that in all his travels, he has never seen anyone as accomplished as John is at pyrography. 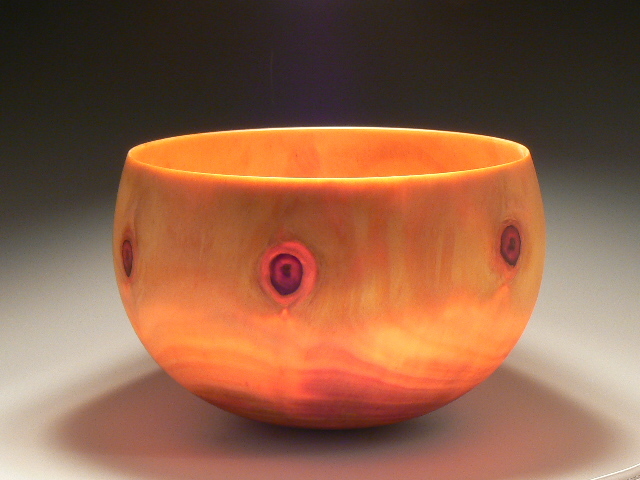 This is a cherry burl piece by Derek Bencomo, titled “Come to me Dancing, Maui Style”. 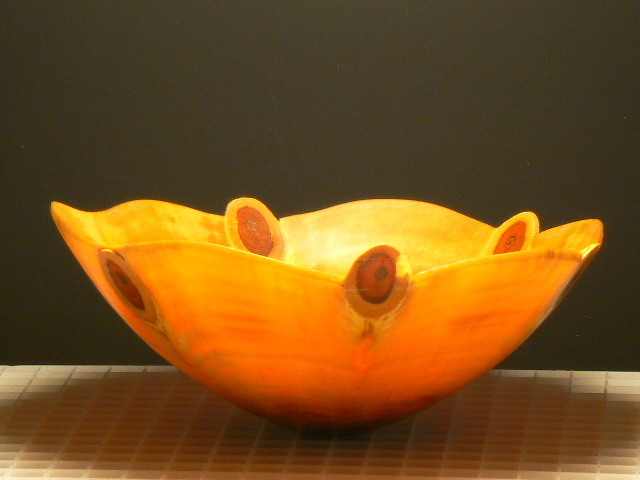 Derek is nationally known for his carved pieces, and this is the first piece that I have seen in person. I really admire the way he has worked out the three sets of hard edges that are basically parabolas –almost points at the three feet that sweep up to terminate in the six points at the rim. In this continuity of line I am reminded of I how Sam Maloof explained the hard edge in his rockers that start at the bent and laminated legs all the way up the arms and to the top of the back of the rocker. After seeing this piece, I want to see more! 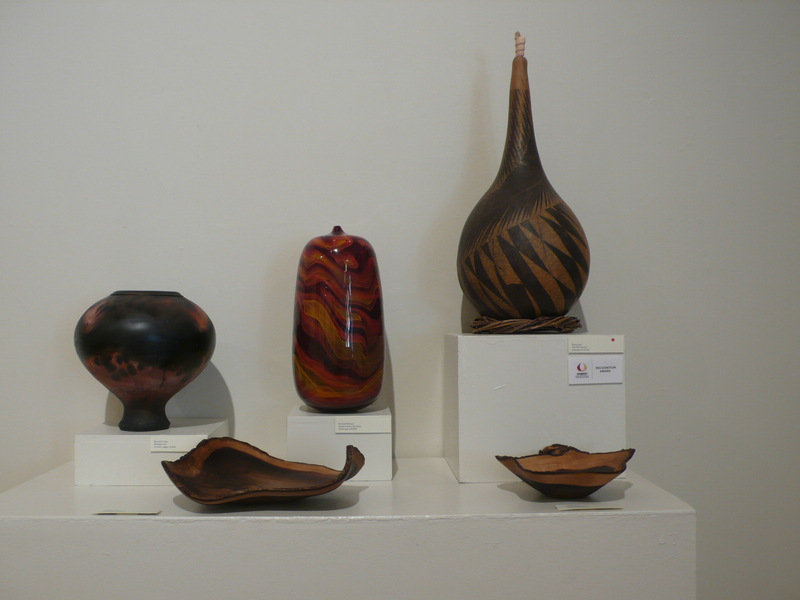 My apologies to other woodturners who had excellent pieces in the show that were not covered here.